You can probably guess where I drank this from the photo. If you need any further clues I can tell you that they have a list of sherries unlike any other in Madrid. This is an oloroso from Manuel Aragon, who has a bodega called “El Sanitorio” in Chiclana at the Southernmost extent of el marco that is probably best known to readers of this blog for being the source of La Bota 62 de Palo Cortado. but I admit that the first thing that I think of is always the Manifesto 119. I wonder what happened to those wines from gateta? Anyway, like the famous Equipo Navazos Palo Cortado what struck me about this oloroso was how lively and youthful it was for the depth and definition of its flavours and aromas. As you can see, crystalline, a bright chestnut red colour. Then on the nose it has a beautiful clean whiff of nuts and sawdust, that just follows on through the palate, with a fresh finish to boot. A really nice spritely oloroso. Can’t quite believe how old it is. One of the wines from a recent stop in at Kulto this was a perfect accompaniment to the manitas (pigs trotters) in thai red curry, and given that combination you can probably guess that this was tasted in less than laboratory-like conditions. A real world tasting, you might say. The wine is characteristically drinkable. It slips in easily enough and a burntish caramel sweet taste, then slight sawdust and woody flavours, which turn to burnt wood bitterness and a really intense, long burn at the finish – acid and salinity. It is a very tasty wine alright – more than a match for the curry – but fine and elegant for all that. Top bombing once again from the guys at Callejuela. Enjoyed this with some meaty callos in La Antojá and it is a winning combination (if anything callos could have been a little spicier to match the oloroso, but it was close enough). It is a classic oloroso. Just look at that beautiful clarity and deep, rich color. On the nose it is nutty and inviting, just a suggestion of caramel, but on the palate it is crisp, dry, acidic – some nutty and burnt caramel in the middle – and then more heat on the finish. A no-nonsense wine for a no-nonsense dish. One of the classic sherry pairings in one of Madrid’s newest and trendiest establishments. I don’t think anybody would describe Wilda (Calle del Leon 9) as conventional, with its funky decoration and selection of equally funky (in a good way) natural and artisan wines. But when you look closely at the wine list and menu you can rest assured that this is also the sort of place you can safely refuel on a crisp winter day. Some classic combinations are possible and this was certainly one. Here the oloroso Villapanés was stately and awesome – this wine is feline like a regal old lion – and perfect with the callos, which are from a famous, michelin starred stable and are super smooth in flavor and texture. And after that well, I know the other sherries on what is a well thought-out little list so I had a bit of a dip with some really interesting wines from Extremadura and some fizz from Toledo (and an XL serving of top drawer arroz con leche, as you can see). Really nice little lunch and well worth a visit. This wine was only released a couple of months ago and in minute quantities but it is already a legend. The maker, the excessively tall and talented Willy Perez, describes it as “the wine of his life”, while one of the leading critics of the modern age calls it “by far the finest white wine I have had from Jerez”. To be quite honest since last June I have been a little smitten with the Fino la Barajuela and maybe didn’t give this wine quite the respect it deserved (to be fair I didn’t have any to drink anyway). But albeit in thimblefulls I have been fortunate to have tried it on a number of occasions over the last few months, in February at the Cuatrogatos Wine Fest, in April when Ramiro Ibañez used it as an example of the wines from years gone by at another cracking tasting at Palo Cortado, at the Bar of Territorio Era (where else?) shortly after release and most recently at a superb tasting with the man himself at Taberna Palo Cortado. It just seems to get better and better. The other night in Palo Cortado it was just superb. Just so powerful and complete in its range: everything from high notes of white fruit and blossom at the top on the nose through concentrated fruit and hints of nuts to mineral power at the bottom, with a richness that doesn’t seem heavy and a balance and perfect shape to it. A fascinating comparison with the finer profiles of the two finos that we had prior to it and with the richer, but slightly heavy, raya that came afterwards – the context really showing off the characteristics of all four. I wasn’t in the best of shape at the time and it looking back at my notes it all became a bit too much: there are a number of swear-words in different languages, a lot of words underlines and block capitals everywhere. I also remember losing my composure in a number of other respects: I was almost overtaken by jealousy of my table mates, convinced that they had been poured 5 ml more than I had, and when the last of the liquid was gone I was overcome with sadness, like that old Jedi in Star Wars when the planet gets blown up. There was talk on the night of a further release years down the line of this wine at 15 years. It is hard to imagine it getting any better, but it is something to look forward to even still. What an absolutely sensational wine. I remember the first time I had this thinking it was a palo cortado and it is definitely finer and sharper than your average oloroso. Has a sharp, vinegary nose, with nuts and caramel, sharp acidity first up on the palate and plenty of nutty caramel and salty flavour without having a big structure or solidity to it. 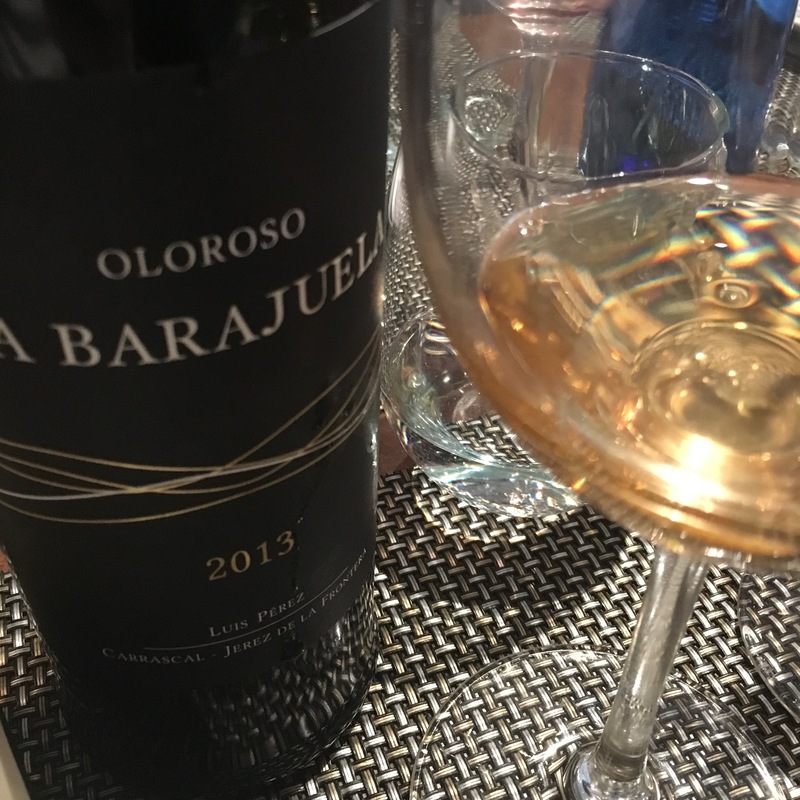 The fine, lighter profile makes it a good wine on the dinner table – and indeed I had this as part be of a cracking lunch at Angelita Madrid – and pretty distinctive stuff.